The original Devil’s® mayonnaise is a pleasantly hot mayonnaise that you can use as basic mayonnaise when you want to give your dishes an extra kick. 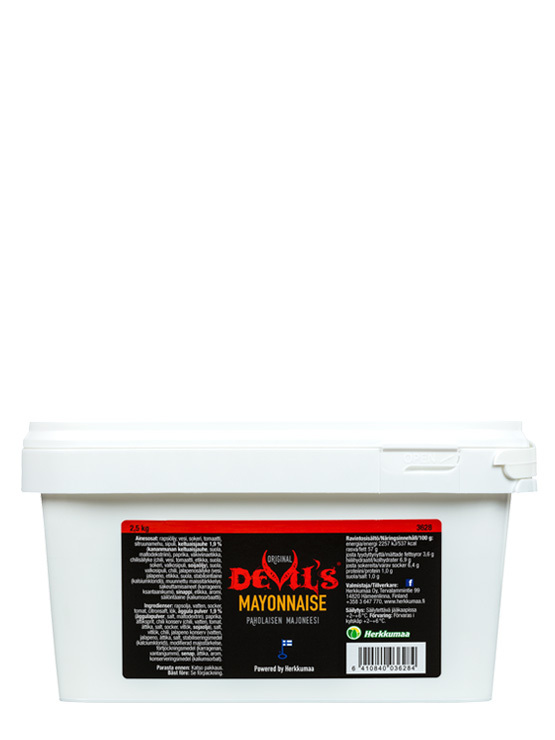 Devil’s® mayonnaise can be used as a sauce or as a base for great salads and dressings. The lactose-free and gluten-free mayonnaise is available in a 2.5 kg package. Ingredients Rapeseed oil, water, sugar, tomato, lemon juice, onion, egg yolk powder 1.9% (egg yolk powder, salt, maltodextrin), paprika, spirit vinegar, pickled chillies (chilli, water, tomato, vinegar, salt, sugar, garlic, soybean oil), salt, garlic, chilli, pickled jalapeños (water, jalapeño, vinegar, salt, stabiliser (calcium chloride)), modified corn starch, thickeners (carrageenan, xanthan gum), mustard, vinegar, flavouring, preservative (potassium sorbate).